A melting pot of African Food. Cameroon food is varied and diverse. The food in Cameroon is influenced by Cameroon colonial history but still retains a lot of Cameroon traditional food and Cameroon cuisine. Also influencing the Cameroonian food is the geographical location of Cameroon. 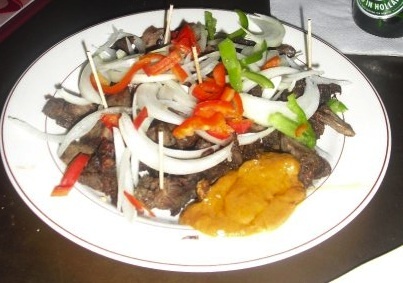 Being at the center of Africa, central west african cultural food in addition to western food are part of Cameroon food. The cuisine is mostly starchy food with some stew food, peanut food and various cassava leaves and cassava recipe. Tomatoes, Corn, Cassava, hot peppers, and other where introduce to Cameroonians in 1472 with the arrival of the Portuguese. With the arrival of the Europeans (German, French and English) Cameroonians were introduced to Omelets, french bread (very popular) and other European style food. European Cameroon food are mostly served as breakfast in Cameroon. Western restaurants and cuisines are available in Douala and Yaounde serving Chinese, French, Italian, Russian, Lebanese, Greek Parisian-style cafes, Pizza and Hamburgers along with traditional Cameroonian food. Regional factor on Cameroon Food. Cameroon staple food is very seasonal. Whatever is in season is usually in abundance and sells for pennies. Once harvest season is over the price increases drastically due to lack of preservation techniques. Corn, beans, rice are a few example. 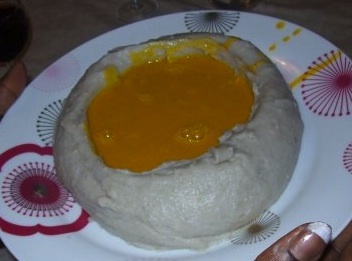 The Cameroon meal generally consist of starchy foods (called Fufu) served with spice sauces, stew or some vegetables. Meat, fish, curries and spicy sauce are common. Cameroon dishes in the south consist of: Root vegetables like yams , Cassava and plantains served with fish or meat mixed with cassava leaves, Okra, and or tomatoes. 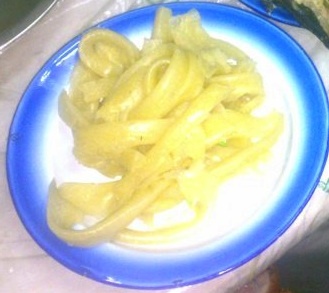 Ndolé is a very popular sauce made of bitter-leaves and prepared in countless ways. Mangoes, Coconut, Bananas, Papaya, Oranges, Limes. Banana Pinneapple Salad is a very popular dessert.